Let me tell you, I was not into the idea of high-waisted jeans when they first arrived back on the scene. It wasn’t their history of being “mom-jeans” that got me. It was the fact that they showed too much of the parts of my body I didn’t want to show off or I typically want hidden. I have shorter legs. Though I always need my tshirts to be on the longer side, I need my jeans and pants to be short or ankle length. Not only that, I didn’t feel I was petite enough to show off the shape that high-waisted jeans showed… meaning a tiny waist. I have a very square cut to my body and I wouldn’t say I have a waist…instead I would tag my shape as a more boy build with some thighs. So, I kind of wrote off high-waisted jeans as an option in my life. Then I got brave one day. It was before I got pregnant, I had been working out and felt pretty good about my body so I thought I would give it a try. I ordered a pair from ASOS randomly. They showed up and to my surprise they were my new instant favorite pants. Instead of feeling insecure about my shape I realized that they made my legs longer and even made things I was wanting to keep hidden feel like something I wanted to show off. Granted, it is all about finding the right pair, but when you do it can be like love at first sight or first button up. If you do find a good pair they do a great job tucking things in all the right places and smoothing out your belly especially if you are post-baby (thus why I think moms wear them and still should hehe). That said, I wanted to share how three simply combos to make the most out of your high-waisted pants especially this time of year. They are fun in the warm months, but I think they can really shine this time of year. I love wearing plaid flannels with very well structured items especially in the fall. The look seems to make it feel more casual and laid-back and the best part of this look is that the black shoes will lengthen your legs with the black pants. You can even make it lengthen them even further and tuck in your plaid shirt. 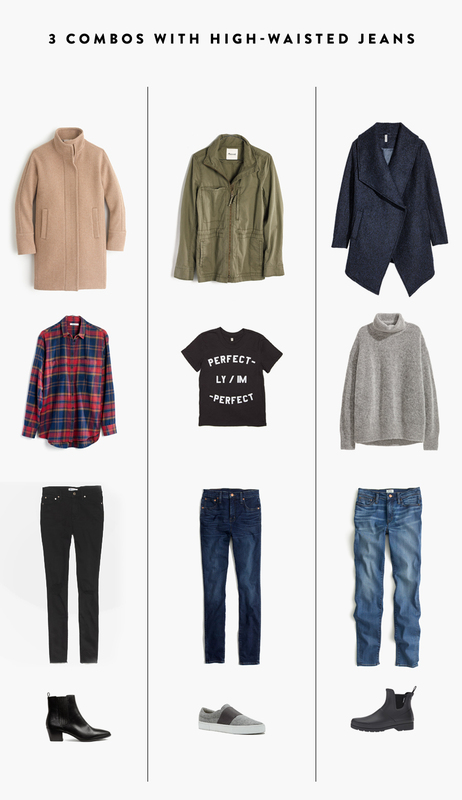 This is a great look for a casual work day. This is the way to wear those skinnies on a Saturday. Toss on a simple tee and your favorite slip-on sneakers. Then if it is chilly throw on an army jacket. It will be comfy and easy to wear to nearly anything your Saturday may have in store. This is a GREAT winter outfit before the snow piles up especially or even if it has made an appearance. I love oversized coats with turtleneck sweaters and the high-waisted skinnies lend well to this look. Top it off with some weather appropriate shoes such as some pull-on ankle wellies. 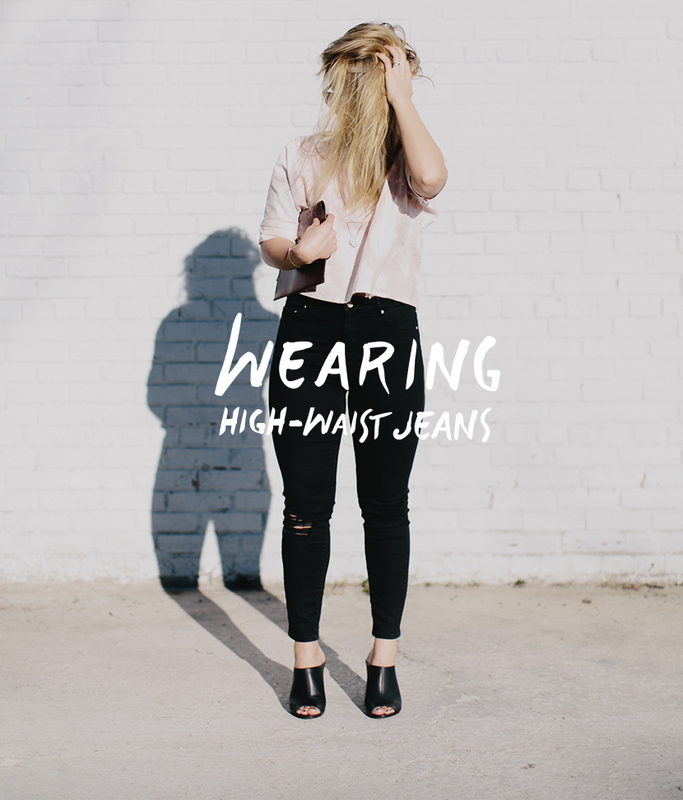 Do you have a pair of high-waisted jeans? How do you wear your’s? What suggestions do you have when looking for the right pair?! HI-WAISTED JEAN PSA: i just jumped ON THIS BANDWAGON TOO. WORD TO THE WISE. AMERICAN EAGLE HIGH WAISTED SUPER STRETCH JEGGINGS ARE LIFE. I HAVEN’T BOUGHT ANYTHING FROM AMERICAN EAGLE SINCE I WAS 17 (I’M NOW 30), AND IN THE LAST YEAR I HAVE BOUGHT FIVE OF THESE JEANS. THEY ARE ALL I WANT TO WEAR. THEY MAKE ME LOOK AWESOME, THEY ARE SUPER COMFORTABLE (HELLOOO SPANDEX) AND THEY DO NOT BAG, OR STRETCH OUT. BUY THEM ASAP BECAUSE THEY SELL OUT QUICK! I WEAR THEM WITH TUINICS, BUTTON DOWNS, SWEATERS, TUCKED IN SHIRTS, ETC. I love high waisted jeans! They fit so NICELY and cover up my love handles which low waited jeans just seams to highlight. Also, I don’t have to be pulling up my pants all the time! YAY!